What goes around comes around. It takes time for the public to catch up with groundbreakers and their innovations. That's why Mozart is so hot after 200 years and why Ornette Coleman now can actually play Lincoln Center. What to do with "What" when it comes around —when the public's ready for it —is tricky. Take jazz, especially "creative jazz." Making something totally new risks over-challenging and possibly alienating newly receptive ears; simply re-creating denies the regenerative, evolutionary essence of jazz as music in process. Standing the middle ground requires a careful balance of three things: having a well-grounded knowledge of the tradition, feeling part of the here-and-now, and transcending the temporal for the spiritual. Head, heart and spirit. Into Equal Interest, Joseph Jarman, Leroy Jenkins and Myra Melford each brings skill and imagination, steeped in the jazz and blues traditions and drawing from classical and folk musics. Individually, each is a renowned performer, composer, and improviser. True to the bent of Chicago's influential Association for the Advancement of Creative Music, which weaves its philosophy throughout their work, they collectively meld their individualism into something new — a whole greater than the sum of its parts which extols the past, exalts in the present, and extends to the future. Jenkins, who is a native of Chicago, was already playing violin by age 8. After graduating from Florida A&M, he taught music in the South for a decade before returning to his hometown. On his return, he immediately joined the then fledgling AACM, performing and recording with pianist Muhal Richard Abrams, trumpeter Leo Smith, multi-instrumentalist Anthony Braxton, and modern drum legend Steve McCall. With the latter three, he formed the Creative Construction Company, one of the first groups to introduce New York to Chicago-based new music. Jenkins has stretched musical boundaries with explorers Archie Shepp, Albert Ayler, Alice Coltrane, Mtume, Cal Massey, and the Revolutionary Ensemble, recording extensively as a leader and sideman for Black Saint, India Navigation, and other labels. As a recipient of numerous commissions and grants, Jenkins (like Jarman) has focused on composing for mixed ensembles, dance troupes, orchestras, and even choruses. He was a founding member of Meet the Composer and continues to perform, teach, lecture, and compose. Melford, also a Chicagoland native, had early piano training which included boogie-woogie lessons. She later studied with Art Lande and Ran Blake, among others. Though she was never an actual member of the organization, Melford professes that the philosophy and music of the AACM were central to her formation and development as pianist and composer. She has performed and recorded with ensembles led by AACM members Henry Threadgill, Jenkins, and Jarman, and is considered to be in the vanguard of the New York "downtown" scene. Melford has performed with Butch Morris, Dave Douglas, and Fred Frith, to name a few. She currently performs in duo with Marty Ehrlich, and leads both The Same River, Twice quintet and her trio Crush. She teaches, composes, conducts performance workshops, and travels and performs extensively. This debut CD showcases what Jenkins aptly calls "the sensitivity and verve" of this broad and deep collective. The distinctive compositions are perhaps best described in their composers' own words. "Poem Song" is an excerpt from a suite that I have written about the gentle nature of Buddhism and the uniqueness of meditation. "Rondo for Jenny" is actually based on musical ideas from South Indian nomadic musical forms that I love. The oboe is there as a voice in the center of the vibration of the nomads. "In the Moment": The best way to capture moments is to pay attention. Wherever you go, there you are. "B'Pale Night" is a blues, but not a blues form. "Over This/Living Music" was written for Joseph and Leroy after we'd been playing together for almost two years. I wanted to capture the spirit of the ensemble, which straddles the line of chamber music and jazz. "The Beauty We Love" is a short meditation on the nature of beauty. "Everything Today" is a kind of sped up, contemporary, "Rhythm changes," inspired by both Ornette Coleman and the Tarif de Haidouks. "Apricots from Eden" is a traditional song and dance from Armenia I heard on a record by Djivan Gasparyan, who plays the duduk, a double-reeded pipe. It's appropriate that the set ends with a dance, since this debut record captures, as Melford puts it, "three playful spirits who have found a common internal space where this music can live and develop." Serious or silly, chaotic or serene, illuminating or obscuring, Equal Interest's music always dances. Feet on the ground and a flair for what's in the air. 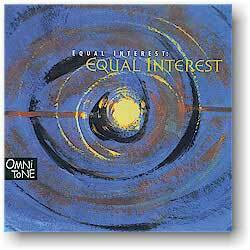 Buy Equal Interest now at the OmniToneStore.